The opening ceremony of International Year of Light 2015 at the United Nations Educational, Scientific and Cultural Organization headquarters in Paris. Here’s a photo of IDA Board Member Connie Walker representing IDA and dark skies at the event. IDA’s Annual General Meeting brings together a wide-range of policymakers, scientists, thought leaders, grassroots advocates, government representatives and others to discuss night sky preservation. There is simply no better meeting for those interested in learning more about light pollution and how to join ranks with like-minded individuals working to protect the night sky. The Annual General Meeting also includes civic planners, lighting industry representatives and others from the business sector who play a critical role in reducing light pollution. IDA also gives talks, presentations and exhibits at conferences and tradeshows throughout the year including the annual Artificial Light at Night Conference, the European Symposium for the Protection of the Night Sky, Light Fair and Strategies in Light. IDA’s chapters are comprised of committed grassroots activists who work tirelessly in their local communities advocating for the protection of night skies. 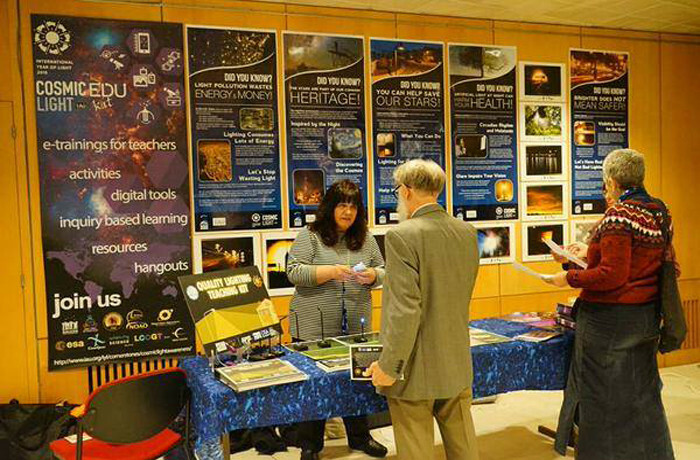 IDA’s volunteer chapters do many things, from organizing dark sky festivals to educating municipalities and the public about light pollution, and are an integral part of our organization’s success. International Dark Sky Week draws attention to the problems associated with light pollution and promotes simple solutions available to mitigate it. Created in 2003 by high-school student Jennifer Barlow, International Dark Sky Week has grown to become a worldwide event and a key component of Global Astronomy Month. IDA is dedicated to empowering individuals and organizations so that they can educate their communities about the importance of protecting night skies. We provide our chapters, members, volunteers and the public with a variety of educational public outreach materials to help them make even an greater impact in their communities. These materials include brochures, traveling displays and our public service announcement, Losing the Dark, available for free download in more than a dozen languages. IDA publishes the electronic newsletter Night Watch and the print newsletter Nightscape to provide members and the public timely updates on light pollution research, IDA programs, eco-friendly lighting and how to make a difference in one’s community. IDA also has a thriving presence on social media, including Facebook, Twitter, Instagram, YouTube. IDA’s Dark Sky Places program promotes night sky conservation across the globe and is a powerful outreach tool for communicating to the public the importance of reducing light pollution. Dark Sky Place designations are based on stringent outdoor lighting standards and innovative community outreach.